Netflix continued to post impressive subscriber growth last quarter -- and profitability is finally turning a corner in the international market. Shares of internet TV pioneer Netflix (NASDAQ:NFLX) have been on a tear this year, rocketing more than 60% higher as the company has continued to add subscribers at a rapid pace while dramatically improving its profitability. Netflix YTD Stock Performance. Data by YCharts. On Monday afternoon, Netflix released a strong third-quarter earnings report, validating investors' confidence. Indeed, Netflix is primed to maintain an extremely high earnings growth rate for the foreseeable future. Data source: Netflix Q2 and Q3 2017 subscriber letters. Chart by author. Domestic subscriber growth continues to moderate. At the end of September, Netflix had 52.77 million domestic streaming subscribers, up about 11% year over year. Yet with average selling prices (ASPs) on the rise, domestic streaming revenue still jumped 19% year over year. Meanwhile, Netflix's international growth is still accelerating. The company added 4.45 million international subscribers last quarter, up from 3.2 million in the third quarter of 2016. In dollar terms, international streaming revenue surged 56% year over year during the quarter. Netflix has consistently prioritized growth over short-term profitability outside the U.S. That said, its older international markets are starting to mature. This allowed the company to post a $62 million international contribution profit last quarter, despite still investing heavily in growth markets like Asia. This was Netflix's second-ever quarterly international contribution profit. The fourth-quarter forecast calls for international contribution profit to nearly double on a sequential basis to $115 million. If this guidance is met, it would end the year with a $207 million contribution profit from international markets, compared to a $309 million contribution loss in 2016. If there was any weak spot in Netflix's Q3 results, it was that domestic contribution profit came in short of the company's forecast. Since peaking at $606 million in the first quarter, domestic contribution profit slipped to $560 million in Q2 and $554 million in Q3. Furthermore, Netflix projects that domestic contribution profit will be roughly flat at $556 million in the fourth quarter. That would be up less than 4% from the prior-year period. However, this slowdown in domestic profit growth isn't likely to last very long. While Netflix is investing more than ever in content and marketing, it is also starting to raise prices again in order to offset rising costs. Netflix is investing heavily in original content. Image source: Netflix. In the U.S., Netflix recently increased the price of its popular HD streaming plan from $9.99 a month to $10.99 for new subscribers. It also boosted the price of the 4K plan from $11.99 a month to $13.99. The price of the basic standard-definition streaming subscription -- which doesn't allow you to watch on multiple devices simultaneously -- stayed put at $7.99 a month, though. Management stated in the earnings letter that these price increases will be rolled out to existing subscribers gradually over the next several months. The resulting ASP increases should drive faster revenue growth for the domestic market, along with an uptick in contribution profit. If international contribution profit continues to move in the right direction in 2018, the net result will be another big year-over-year earnings increase for the company. 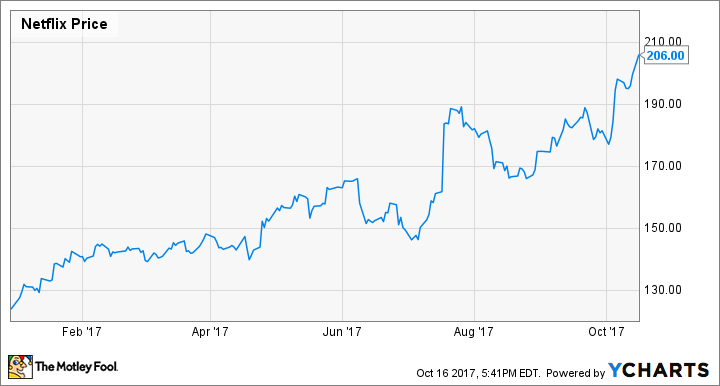 Considering how much room Netflix has for subscriber growth and margin improvement in the international market, this earnings momentum could continue well beyond 2018.